Will National Defense Authorization Lead to Indefinite Imprisonment of Americans? Telling the Truth About NDAA? There’s a story circulating on the Internet that was posted last Wednesday at ACLU.org by Chris Anders, in which it was put forth that the latest NDAA includes provisions that would allegedly make “the battlefield” your back yard, and make American Citizens subject to indefinite imprisonment and subject to military authorities. Of course, with the state of things in this country, it’s not entirely out of character for the folks in Washington DC to view Americans as an enemy, but I also know that the ACLU has its own axes to grind, and part of the trouble with Mr. Anders’ article is that it contains references but no links to the specific provisions of law he says are problematic. Worse, in publishing the article, rather than provide links to the actual legislative language, or links to the proposed [Udall]amendment Mr. Anders seems to be advocating, the links for the Amendment take readers to an activism page aiming to lobby Congress. Notice that Anders includes a link on the words “the power” but rather than taking you to the text of the bill, or some description of “the power,” instead, the link directs you to an advocacy page where you can fill out a form and petition on behalf of the Udall Amendment. There are eleven hyperlinks in the body of the article, and of these eleven, nine take you to this same destination. In fact, rather than pointing you to the specific language of the Udall Amendment, the words “Udall Amendment” are linked three times to the ACLU petition page. That’s simply dishonest. Readers have an expectation that when they see a word or name that includes a hyperlink, it will take them to some source or related information relevant to the linked text. Anders certainly didn’t seem to want you to see the actual Udall Amendment, which now leads me to wonder why. Naturally, I went out and found the Udall Amendment, and have linked it as Anders should have done. 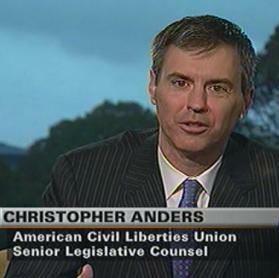 The real problem with Anders’ article is that it does a lot of huffing and puffing, and in breathless terms describes provisions in a bill that by his characterization will lead to American citizens being arrested by US military forces in the back yards and leading to indefinite incarceration without charges, bail, or due process of law. That would be a terrible and astonishing thing for the Congress to do under any circumstance, and I would loudly oppose it if that were the case here. In point of fact, I’d be calling for Americans to join me in opposition, but that’s not what I’m finding. Instead, what I’m finding actually conflicts with Anders’ characterization, and suggest dishonesty on his part. Again, rather than try to characterize the provisions of Senate Bill 1867, I went out and found it for you so that you can make your own decisions based on its actual text. The allegedly tyrannical provisions are sections 1031 and 1032. SEC. 1031. AFFIRMATION OF AUTHORITY OF THE ARMED FORCES OF THE UNITED STATES TO DETAIN COVERED PERSONS PURSUANT TO THE AUTHORIZATION FOR USE OF MILITARY FORCE. (a) In General- Congress affirms that the authority of the President to use all necessary and appropriate force pursuant to the Authorization for Use of Military Force (Public Law 107-40) includes the authority for the Armed Forces of the United States to detain covered persons (as defined in subsection (b)) pending disposition under the law of war. (d) Construction- Nothing in this section is intended to limit or expand the authority of the President or the scope of the Authorization for Use of Military Force. (e) Requirement for Briefings of Congress- The Secretary of Defense shall regularly brief Congress regarding the application of the authority described in this section, including the organizations, entities, and individuals considered to be `covered persons’ for purposes of subsection (b)(2). SEC. 1032. REQUIREMENT FOR MILITARY CUSTODY. (3) DISPOSITION UNDER LAW OF WAR- For purposes of this subsection, the disposition of a person under the law of war has the meaning given in section 1031(c), except that no transfer otherwise described in paragraph (4) of that section shall be made unless consistent with the requirements of section 1033. (4) WAIVER FOR NATIONAL SECURITY- The Secretary of Defense may, in consultation with the Secretary of State and the Director of National Intelligence, waive the requirement of paragraph (1) if the Secretary submits to Congress a certification in writing that such a waiver is in the national security interests of the United States. (C) Procedures providing that a determination under subsection (a)(2) is not required to be implemented until after the conclusion of an interrogation session which is ongoing at the time the determination is made and does not require the interruption of any such ongoing session. (d) Effective Date- This section shall take effect on the date that is 60 days after the date of the enactment of this Act, and shall apply with respect to persons described in subsection (a)(2) who are taken into the custody or brought under the control of the United States on or after that effective date. I think this is disingenuous at best, and outright dishonest and inflammatory at worst. He’s clearly trying to incite a fearful response based on suppositions I don’t think a fair reading of these provisions explicitly or implicitly would enact. Of course, I knew that this might well be the case when I saw that PrisonPlanet.com was covering this story, because that site is largely authored by real conspiracy kooks. Sure, they find some interesting material, but as in this case, I think their willingness to stretch the meaning and clear intent of things leads to a sort of self-destructive, self-defeating exaggeration and an atmosphere of bombastic claims most of which turn out to be overblown or entirely bogus. Frankly, once Alex Jones is involved, a story loses much of the credibility to which we might otherwise attach, because Jones has a long history of turning loosely connected events and circumstances together in some of the most convoluted conspiratorial garbage on the Internet. To each his own, but really, once this loon went down the whole “controlled demolition” rabbit-hole with the so-called “9/11 Truthers,” that was the end of his credibility, and with him, the credibility of anything posted on his sites. The Senate’s bill may have some problems, but Anders’ characterization is dubious at best. I think it’s clear that he and the ACLU are trying to create a lot of smoke where there is no fire, and I think the Udall Amendment is intended to place mandates on executive branch actions that may or may not be in the best interests of the United States, but could be understood to hamper this or any future President in acting as the Commander in Chief. Whether the Udall Amendment is worthwhile is itself a matter of some controversy, but what is clear to me is that the ACLU is misusing this article to drum up a political issue without providing any substantive arguments. I’ve yet to see how any of Anders’ claims are substantiated in the text of sections 1031 or 1032, as posted above, and these provisions certainly don’t match the claims. If this is the best case the ACLU can make against these provisions, it’s time to admit that the ACLU has other motives with Anders’ article. The method of presentation, the lack of citations, and the disingenuous appraisal suggests strongly that the ACLU is grasping at straws. As much as anybody, I don’t trust our government, particularly where the liberties of the American people are concerned, but this story seems designed to mislead the American people, or to incite fear among them. This could be a serious issue, but the version of the bill now posted indicates none of the dangers that Anders implies. It’s dangerous to lead the American people astray, and in this case, I think it’s clear that Anders is doing just that.